The department offers a comprehensive range of service catering to the diagnosis and treatment of all ENT, Head & Neck disorders. We are also the first department in the state to combine the services of Head & Neck Onco-surgery with reconstruction and ENT under one roof. Keeping pace with the advances made in the field we at Citizens Specialty Hospital employ the latest technologies in the diagnosis and treatment. A team of dedicated clinicians work closely with other medical and surgical specialists in the diagnosis and treatment of all types of head and neck disorders. The team adopts multidisciplinary approach to provide up-to-the-minute surgical and medical care for patients. At Citizens hospital we employ the latest cutting edge Lumenis CO2 DUO laser which proudly is the first installation in the world to treat a variety of Head and neck cancers which previously needed wide open surgeries. At Citizens we employ Image guided navigation (Medtronics S7 navigation) to perform minimally invasive sinus surgeries in which the patient have very fast recovery and will be ant home within a few hours after surgery. With this minimally invasive procedure patient can go back work or school from day three of surgery. It is a non surgical way of treating sinusitis a kin to angioplasty of the heart. 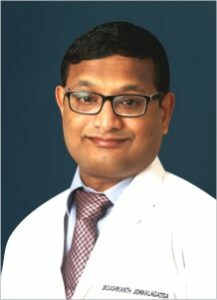 This ultra modern minimally invasive technique is offered in very few centers in the country and Citizens in one of them. Dr. Sashikanth having trained in USA has perfumed around five hundred of these procedures. We employ the latest arthocare collator to perform painless tonsillectomies and adnoidectomies in children. The same technology along with lasers can be used to perform minimally invasive sleep and snoring surgeries. At Citizens Speciality Hospital, we employ the latest cutting edge Lumenis CO2 DUO laser which proudly is the first installation in the world to treat a variety of Head and neck cancers which previously needed wide open surgeries. At Citizens Speciality Hospital, we employ Image-guided navigation (Medtronics S7 navigation) to perform minimally invasive sinus surgeries in which the patient have very fast recovery and will be ant home within a few hours after surgery. With this minimally, invasive procedure patient can go back work or school from day three of surgery. It is a non-surgical way of treating sinusitis a kind angioplasty of the heart. This ultra modern minimally invasive technique is offered in very few centers in the country and Citizens in one of them. Dr. Sashikanth having trained in the USA has perfumed around five hundred of these procedures.